Home > News > New FIFA 19 Prime ICONs! This Friday, EA Sports will be revealing some unprecedented ICONs - FIFA 19 Prime ICON Moments are coming to FUT packs on February 15th! By now there are only three Prime ICON Moments FUT cards that have been known to us. These new cards will be in packs on Friday, and we could also expect some ICON SBC to be in place. 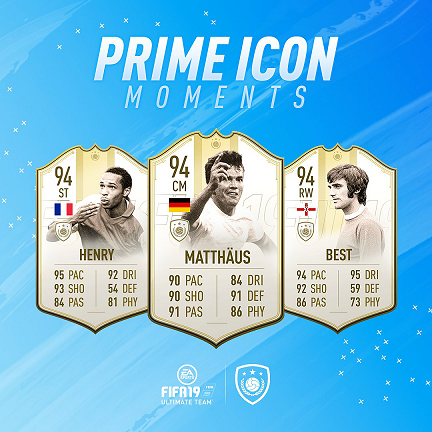 FIFA 19 Prime ICON Moments will be released in order to celebrate heroic moments of ICONs in their prime. Come and buy your FIFA Ultimate Team coins here at www.igvault.com/FIFA-19-Coins! We offer the cheapest and safest FIFA coins in the market. Buy coins now and get ready for the brand new FIFA 19 Prime ICON Moments event!